I am always in awe of how people, when given a chance, can be creative. 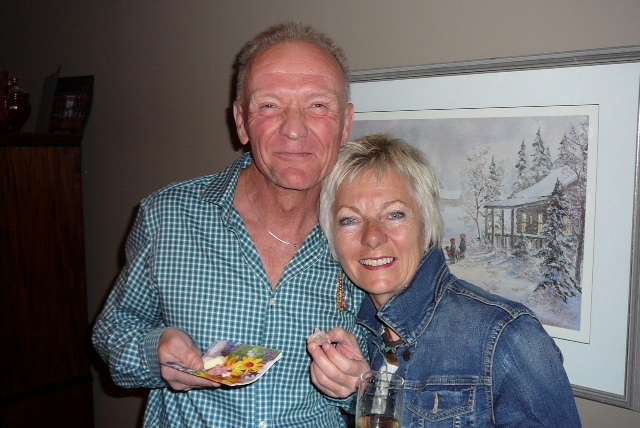 At our wedding, we wanted to create ‘something’, that represented family, its many facets, colours, elements, members. We wanted to show how our family was coming together. Two parents with their four children, and all the tributaries flowing into One. Pinterest has lots of interesting ceremonies couples use to show this — sand poured into a jar by the bride and groom; knots tied in a rope, shells added to a dish, names to a figurative tree. The ideas are many and varied. 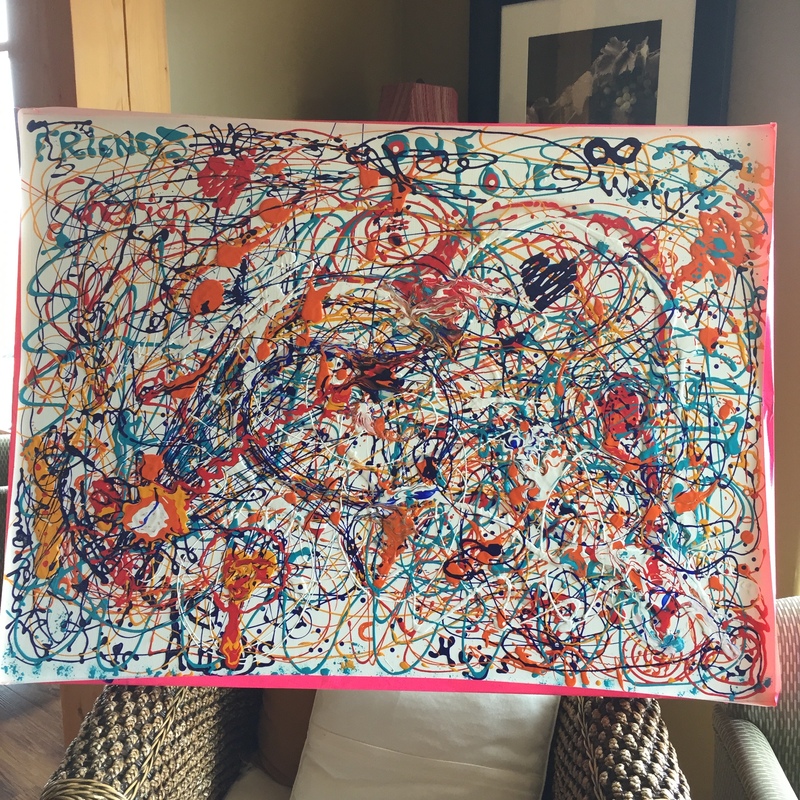 As an artist I wanted something that reflected not just family coming together, but the creative uniqueness of each of us and how we all contribute in our own special way to the whole. We decided to do a ‘paint pouring’ ceremony at the wedding. Pouring paint can be messy. An acrylic pouring medium is added to the paint which can make it very fluid. Once poured onto the canvas its natural desire is to flow everywhere. That wouldn’t do at a wedding. We needed something that would flow but would still be thick enough when poured to hold most of its form so that it wouldn’t run off the edges of the canvas onto the floor or people’s clothes. Cactus Arts, one of my favourite purveyors of all things that feed my artistic needs, sells a French brand of paint that was perfect: Pebeo paints are thick, opaque and in some colours, metallic or iridescent. Their ‘flowability’ can be controlled, even when pouring medium is added to them. Which is why, on Saturday morning of the wedding, when Jerry W. a dear friend arrived at the venue to ask if he could help, I immediately gave him the task of mixing paint. Joyfully he tore off a big piece of plastic to cover his clothes and set himself up in the ‘paint pouring’ corner to complete his task. Later, after C.C. 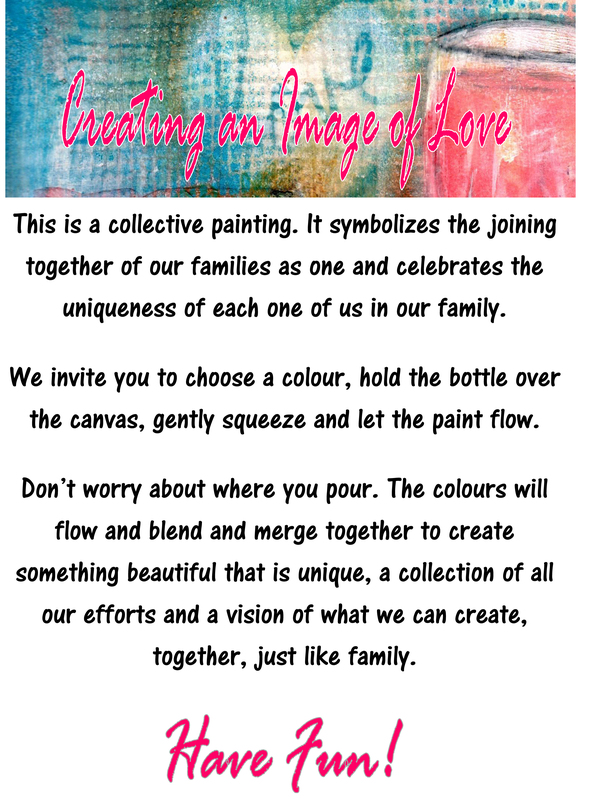 and I had finished the first pour and then our children each had added their colour to the mix, we invited all our guests to join in and help us paint a picture of love and family. It was spectacular! All through the evening, people poured and laughed and added their special and unique mark to the painting. Some went back to add another mark or came back to see what new element or idea was added. What began as just an idea turned into a beautiful representation of love, family and friends. We are delighted. Once I’ve added a resin to the surface to protect it we will hang it in our living room where it will be a beautiful reminder of not just our wedding but of everyone in our lives who add such beautiful and vibrant hues to create the circle of love that is our life. Categories: Wedding vows | Tags: love amongst the vines, painting together, poured painting, unity ceremony, wedding vows | Permalink. It is truly Amazing!! creativity at its best! Thanks for sharing Louise. This is so beautiful!! Love the idea!